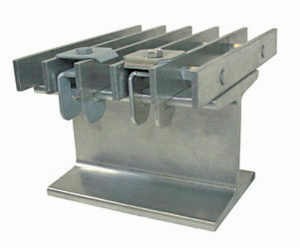 G clips are used to fasten bar grating directly to the edge of a structural steel beam. They feature a three-part assembly that provides exceptional fastening strength while remaining fast and easy to install. A variety of configurations allows for a broad range of potential applications and a high level of overall flexibility. G clips consist of an upper saddle that connects to a bottom portion using a hex headed cap screw. A variety of saddles are available for use with different grating spacing sizes. The lower component connects to the underside of the structural beam, holding the grating firmly in place. Multiple screw lengths are available for use with grating assemblies of varying depths — use longer screws for deeper grating. Marco can provide bar grating G clips in galvanized steel, stainless steel, aluminum and cupronickel alloy. Galvanized steel is our most economical option. Stainless steel and aluminum both deliver better corrosion resistance and are more suitable for heavy-duty applications. Cupronickel alloy offers the best performance in marine environments as it is highly resistant to seawater corrosion. Grating Height 1/4" - 3/4"
Compared to Z clips, G clips offer excellent fastening abilities as they attach directly to the underside of a structural steel beam. The main drawback is that, because of this they offer less installation flexibility. Z clips are smaller and more versatile, and can be used to fasten riveted grating and other products that don’t permit the use of wider saddles. Unlike G clips, Z clips are also a one-size-fits-all solution — there is no need to choose a specific top for different applications. The biggest benefit to using G clips for bar grating is that, when fastened with a self-tapping screw, they greatly reduce the amount of time and labor involved in installation. This makes them a strong choice for applications in which grating needs to be routinely removed for cleaning or other work. G clips are just one of the many types of fasteners we offer for use with our fabricated bar grating products. The right choice for your application will depend on a number of factors, including the size and material of the grating, and the environment it will be exposed to. Grating can also be welded in place for a stronger, more permanent installation. To learn more about your options, get in touch with a Marco Specialty Steel representative directly. Use the contact form on this page to get started today.